Triplets, Rafaela, Rochele and Tagiane Bini share not only the same birthday, but also the same looks, tastes, and now - after marrying men who look strikingly similar - the same wedding anniversary too. It was a triple celebration for guests when three identical sisters walked down the aisle together on the same day and at the same ceremony. 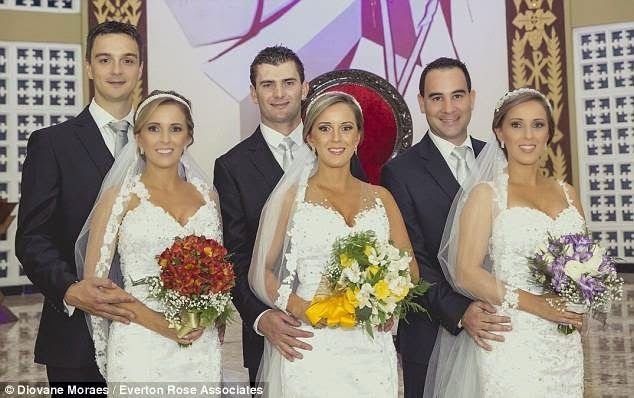 The 29-year-old triplets from Passo Fundo, in southern Brazil, wore the same wedding dress (with different straps), as well as identical hairstyles and makeup, for their big day last Saturday. Their different colour of bouquet was the only clue to help friends and family differentiate one bride from the other. Even the grooms; Rafael, Gabriel and Eduardo, admitted they had worried they might mix up their wives-to-be when it was time to exchange vows. Rafael, who married Rafaela, told how the girls sometimes deliberately confused their fiances. He said: "There was a time when we were all in the kitchen making dinner. So Rochele, who is Gabriel's, was doing stuff at the sink, and Rafaela was at the stove. "We were there chatting and they changed places. I went behind to hug her, and said 'oops' when I realised I'd got the wrong girl." However, on the wedding day, the men insisted they didn't have a problem recognising their brides. Eduardo, who married Tagiane said: "Oh yes, I knew which one was mine, for sure. I knew as soon as she entered the church, she was the most beautiful." According to the sisters, just like other identical siblings, they have always been close and shared the same tastes and interests since they were babies. Their parents, Pedro and Salete, already had one daughter, Liziele, when they decided to increase the family - but never imagined three more girls would come at once. According to the girls, their mother fainted when she was told she was expecting triplets. Of the three girls, Rafaela was the first to find her future husband, Rafael, ten years ago while studying at university. A year later, Rochele got together with Gabriel. It was parents Pedro and Salete who suggested the girls all get married together after Tagiane also got engaged to Eduardo. The only problem for Pedro, a farmer, was how he would walk all three daughters down the aisle at once. He said: "We decided that we would all walk down the aisle until half way down the church.  From there, I would take one at a time." The pews at the Nossa Senhora Aparecida catholic cathedral in Passo Fundo were moved apart to allow more space for the three brides to walk down the aisle together. They were followed by 18 bridesmaids and page boys, each using the chosen colour of the bride they were representing - yellow for Rafaela, blue for Rochele and red for Tagiane. The first to be taken to the altar by their father was Tagiane, who was the first to be born. She recalled: "I tried to hold back my emotion, but I couldn't. To see my dad there, at that moment, was a feeling I can't explain." The sisters explained how they all went together to get their hair and make-up done with the intention of looking different. But, according to Rochele, "We tried a number of styles, but we all liked the same one. It's not even worth trying, it always ends up like that." After the ceremony, the fact that there were three bouquets to be caught was not lost on the female guests, the sisters said. And for Eduardo, the fact that triplets run in their wives family hasn't put the husbands off. He said: "We're going to think about starting our family. If we have triplets, it won't be easy, but they will be a blessing and we'lll raise them with love."